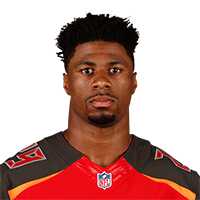 Published: Aug. 9, 2018 at 10:36 p.m.
Tampa Bay Buccaneers cornerback Ryan Smith intercepts quarterback Bryce Petty to seal the Buccaneers victory. Published: Nov. 19, 2017 at 02:36 p.m.
Tampa Bay Buccaneers cornerback Ryan Smith tackles Miami Dolphins wide receiver Jarvis Landry and forces a fumble. Published: Sept. 17, 2017 at 01:45 p.m.
Tampa Bay Buccaneers linebacker Cameron Lynch recovers Bears muffed punt.